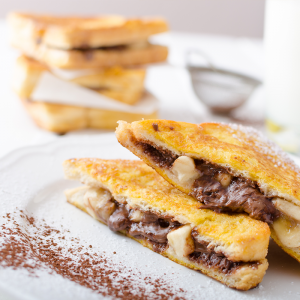 Spread one tablespoon of Nutella on the face of each slice of toast. Top one with banana slices and place second slice on top. Heat the frying pan and melt ½ of the butter. Place the sandwich into the pan and fry until golden. Add the remaining butter to the pan and flip the toast, cooking until the other side is golden.